Mary Gerrells Lewis, age 89 of Cleveland, passed away on Sunday, October 21, 2018. Mrs. Lewis was born on January 20, 1929, in Cleveland, Georgia, to the late Haskell and Maude London Gerrells. 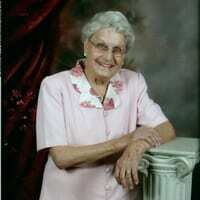 She was a homemaker and a member of First Congregational Holiness Church of Gainesville. Mary was preceded in death by her husbands, Charles Mize, Donnie Whitfield, and Lee Lewis; 5 brothers; 2 sisters. Survivors include her daughter, Joann Mize Skelton, Cleveland; son, Johnny Mize (Fellis), Cornelia; granddaughter, Donna Jean Parks; 3 great-grandchildren; several nieces and nephews. Memorial services are scheduled for 10:30 A.M. Tuesday, October 23, 2018 at the Chapel of Barrett Funeral Home. The Rev. Bobby Griffin will officiate. Inurnment will be at Mt. View Baptist Church Cemetery. The family will receive friends from 10:00 – 10:30 A.M. prior to the service on Tuesday.